Packed full of EAN32, twins and side mount gear, cameras, and a full boat of divers we headed out on Oceancat on a beautiful sunny day and flat seas. We voted on Gotham City for our first dive which is a large rock similar in shape to Ayres rock and sits in thirty five to thirty eight metres of water. My camera that I am still getting used to with double strobes managed to detach itself from the torch and mount as soon as we jumped in the water so I decided I would fix this at the bottom due to a strong surface current. Two camera parts in both hands we headed to the front of the boat and descended. On the descent I noticed Nick K had an issue and had returned to the surface. Expecting he would sort this out I battled the current to the chain and waited on the line for him. Another descent attempt failed and he returned to the surface and seemed to be getting out. Wanting to make sure he was ok I ascended slowly to find he had a problem with his regulators and that I should go and buddy up with another couple. After all of this I was pretty tired already so decided to leave my camera and torch on the boat, catch my breath and get back down there. I descended and buddied up with Mark and Kathryn. The visibility was great at twenty metres and the current seemed to calm down a lot once we were on the rock. It was a fascinating dive site. I maxed thirty metres near the bottom but didn’t go right down due to being on EAN32. Which wasn’t really an issue because there was plenty to see on the top of the rock that sat at twenty five to thirty metres anyway. I felt naked without my camera and remembered just how easy diving is without all the task loading of handling a bulky camera all the time. But I was quickly reminded of why I take my camera with me when we spotted several beautiful Spotted Eagle Rays close by. We got a front row seat on top of the rock on the outer edge and waited patiently whilst three elegant Rays glided up towards us in perfect symmetry. Of course no camera! Sigh. I was mentally taking photos of them the whole time as they performed and danced away only a metre from our faces. Visibility was twenty five metres, strong surface current easing out nearer the site, I had a thirty seven minute dive here on my second attempt. The second dive was on the Owen Stanley. Owen Stanley is a rocky terrain site covered in valleys, trenches and small pinnacles or bizarre shaped rock formations. I spent the first ten minutes playing around with my strobe sync cables as the strobes weren’t firing and I managed to fix the problem eventually. This must have been a bore for Nick and Rob, however I then decided to make up for it by boosting it to go and explore the site. Visibility was twenty metres and no current, so it was quite a pleasant lazy dive. 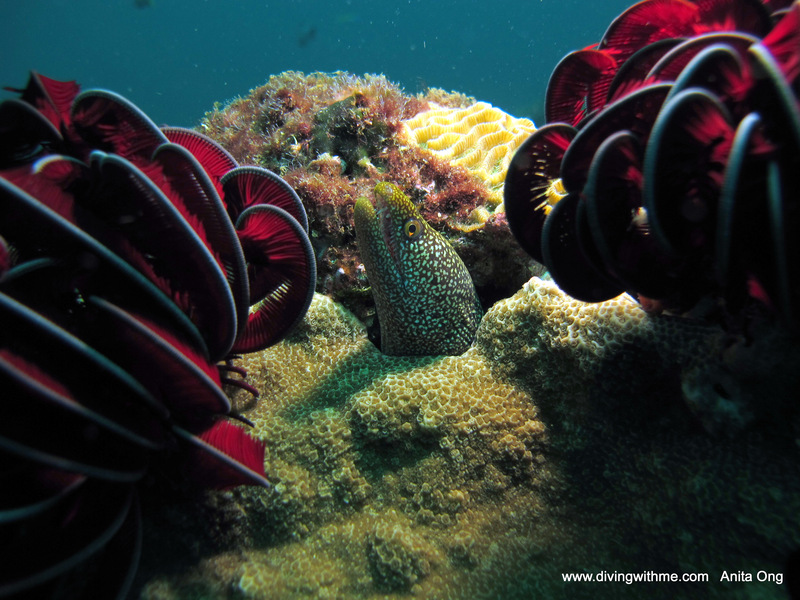 We found Moray eels, a fish cleaning station, Cod, Wobbegong Sharks, and your usual suspects. We had a fifty one minute dive here, water temperature was nice at twenty four degrees, and maximum depth was twenty two metres. Our third dive was a short dive at The Hustler Wreck which those of us with enough gas leftover could do. There was a strong current here and even at the wreck there was little shelter with which to hide from it. 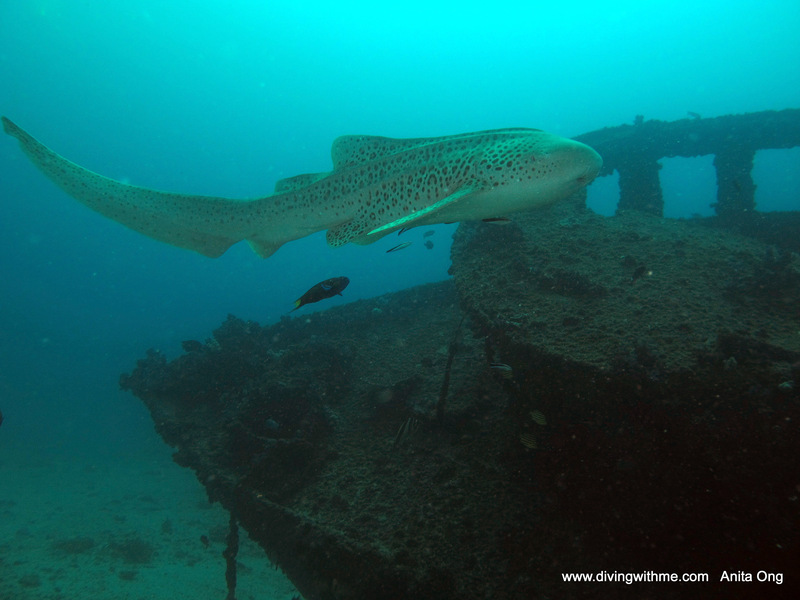 I got close to a Leopard shark, but mostly we played around the small wreck. Visibility was fifteen metres and it wasn’t long before we had to head back. Doing a safety stop was interesting on the line with everyone else, and I had to do mine a little higher at three metres so we could all have some space. A big day of diving but really enjoyed it, especially Gotham City.